As I come to the last few months of my term as Chair, I cannot but feel very privileged to have served with such a great group. The Friends’ programme is now very diverse with a lot of different and stimulating experiences for our members as well as for our community. 2015 has been an exciting year for us. As we start planning for our 35th Anniversary year in 2016, we are working very closely with the Art Museum, the students and our community. This May Young Friends proudly co-hosts with Le French May an exhibition on Climate Change with the support of WWF Hong Kong featuring artwork by French Illustrator Nicolas Vial and 5 young Hong Kong artists, creating a cross cultural platform for our young talents in a long established art & culture festival. The very popular Chair’s Series continues with a conversation on the history and restoration of the Bethanie and a talk on family history dating back to the 1840s by Ruy Barretto - not to be missed. Gallery Group is expanding from strength to strength with visits to galleries and private collectors’ homes. I am sorry some of you were not able to attend but as these are private homes, we are allowed only a limited number for these very exclusive treats. Do not forget to check out the fun and attractive destinations for Friends tours and sign up early to avoid disappointment. Study Group remains a regular favourite. We have a fabulous range of stunning products, ideal gifts for friends and family in the summer. Our products are now available at Asia Society, St John’s Bookstore and the Art Museum. Please contact Cynthia directly if you have any queries. This year we approached CUHK Fine Arts student groups directly to get to know them better and nurture a closer relationship. As we offer grants and scholarships to the CUHK students, we wish to understand their needs and how we can enhance our support. We are looking into increasing our sponsorship to the summer internship programme at the Art Museum for a student outside CUHK to broaden the exposure of the museum, and a Grant for a Final Year PhD student as they may have difficulty finding funding towards the end of their research. All this is possible with the support of our members. And I would like to ask you to come and support us on 11th June at the Re-Launch of the Collectors Circle at Asia Society. Do not miss our exciting panel discussion on C21 Challenges faced by curators and collectors with Professor Jenny So from the Art Museum, Jessica Harrison-Hall from the Brutish Museum and Cissy Pao Watari, private collector, Honorary President of the Hong Kong Arts Centre and a member of the West Kowloon committee. We are honoured to co-sponsor this with the Asia Society and Asia Week Hong Kong. We will be sharing further news on the Collectors Circle. I hope we can rely on your support. As the Friends expand with a wider programme, we are also expanding our workforce. We have some wonderful volunteers helping us with our events and activities, without whom we are unable to run such an extensive list of activities. I wish to thank the following volunteers for their support, enthusiastic energy and time in the last year: Clementina Cardoso, , Ida Chow , Saima Chughtai, Christine Mar, Naomi Molson, Elaine Riley, Kumiko Matsushima, Peter Stuckey, Sharon Vipond, Carol Wong, Ida Yau and the Young Friends Committee members: Vickie Li, Cristine Li & Sophie Selby. As you must appreciate, without the help of all those behind the scenes, these wonderful events simply would not happen! If you are interested in helping the Friends and joining this big happy family, please do not hesitate to contact one of the Board members. We actually have a lot of fun! As many of you have noticed, we are using Eventbrite to facilitate event booking which saves our event organisers a lot of work. We understand you may find the procedure unfamiliar but please do not hesitate to contact one of us should you encounter problems or are not sure what to do. I am sure you will be delighted to hear news of some of our student award recipients. Our first Madeleine Tang Friends Research and Education Fund Awardee, Chan Lai Pik, is now senior curator at the Asian Civilisations Museum, National Heritage Board in Singapore. If you happen to be in Singapore, please drop by at the museum to say hello to Lai Pik! Sam Tsang recipient of our Art Radar Art Journalism and Writing Course Scholarship 2014 has scored the highest marks ever in the final test at the institute. We should be proud of the opportunities our collective efforts have created for our students! I hope you enjoy reading this newsletter and again I would like to express our gratitude to Alisan Fine Arts for sponsoring the newsletter this year. The sponsorship allows us to share our news and fascinating articles with you as well as reach out to a larger community to expand our network. It is also an opportunity to feature the art work of our students on the front cover. We wish to thank Yick Fung Printing Company for their unfailing and invaluable support for the artistic and design layout which saves hours of labour for our editor! May I take this opportunity to wish you all a happy summer and thank you again for your continuous support for the Friends. Happy New Year! I hope you all had lovely year end festivities with your families and that you are ready to enjoy a great new year with the Friends with lots of exciting programmes, talks, gallery visits, tours, study group and fun times together. The Friends Board has now expanded to 13 members as we are offering a more extensive programme and developing a closer relationship with our university, our students, our community, as well as the Art Museum. 2015 will see how we are able to benefit our members, our students, our community with the work we do and the funds we raise. In turn the Friends will also benefit from this beautiful rapport. We are also working on celebrations for our 35th Anniversary in 2016, including a relaunch of the Collectors Circle with the goal to raise enough funds to acquire an Anniversary gift for the Museum. There will be an event to launch the Collectors Circle on 11th June at the Asia Society, so please mark your diaries. We hope we will have your support in many different ways, so please look out for news of our plans and announcements. 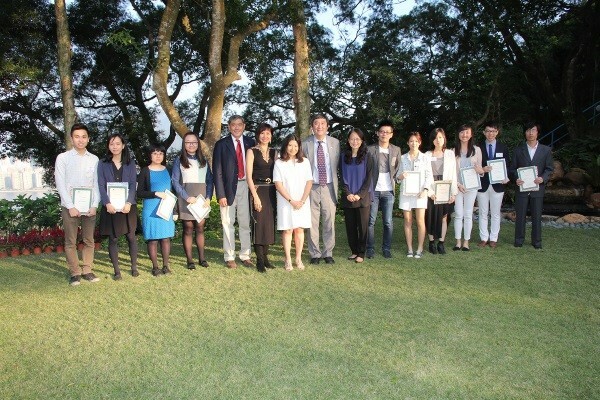 In December, CUHK hosted the opening ceremony of the Golden Jubilee Garden of Appreciation and dinner to which donors and friends of the university were invited. As Chair, I attended on behalf of the Friends. The Friends are included as one of their long term major donors. Our name is listed and displayed on a very special TV screen built in an artistic piece of sculpture in the CUHK landscape in the Golden Jubilee Garden of Appreciation right outside the Sir Run Run Shaw Hall. We, the Friends, feel very proud of our contribution to the university. Please do visit the Garden and see this screen when you next visit CUHK. 2015 kicks off with a fantastic talk by Yin Hung, part of the Chair’s Series on her incredible family story from her childhood life in a reform farm in Hubei to her current successful business empire. To follow, we have exclusive visits to private homes to view art collections, the Chair’s Series on a WWII diary and the historical site of the Bethanie, exclusive tours at Art Basel and other Art events, Part Two of the series on the Northern Nomads, Part Two of our Ceramics demonstration and talk, and many more …..
We also have an interesting selection of tours lined up in the coming year, so do not miss out and sign up early. Or if you have good contacts or would be interested in leading a tour, please get in contact with Therese. The Friends recently have launched a line of beautiful products - they make excellent gifts. If you missed the fairs in the autumn, they are on sale at selected events or you can contact Cynthia, our products coordinator. Young Friends are working on a number exciting projects, so please watch our notices. We are also hoping to work closer with our own CUHK artists and graduates and will be advertising their shows and exhibitions. We are very grateful to our generous sponsors who have made it possible for us to offer a diverse programme at such wonderful venues. In the last year Asia Week Hong Kong has sponsored students to attend our talks and lectures, they are working closely with us supporting our events in different ways, thus allowing us to explore opportunities and realise our goals. I would like to express our appreciate for their ongoing support. You may recall that in 2013 we introduced the Art Radar Art Journalism and Writing Scholarship. It is a 6-week online course. The recipient in this our second year is Samuel Tsang. There are two articles by Samuel in this newsletter! Art Radar recently interviewed me in regard to the Friends’ goals and objectives. The full interview is available at: http://artradarjournal.com/2014/11/14/chair-of-the-friends-dominica-yang-on-making-art-accessible-interview/ Art Radar and the Friends are pleased to be working together in this new initiative to reach out to students. We are constantly exploring new opportunities to broaden our programme of outreach to the young community. We are always open to ideas and welcome new contacts and suggestions, so please do not hesitate to get in touch with one of us or if you are interested in joining the work team! I look forward to seeing many of you in the coming months, either at CUHK or one of our events. I would like to thank our newsletter sponsor, Alisan Fine Arts, for their support and generosity. Their sponsorship has assisted tremendously with the high costs of production without which we would not have been able to donate as much as we did. I would also wish to draw your attention to another generous and supportive sponsor, Yick Fung Printing Company. Nicholas and Angel Ho have been offering us free design and layout service and advice for our newsletter since last April. I would particularly like to thank Maggie Lee at Yick Fung for her incredible patience and invaluable assistance. I wish to express our sincere gratitude to all our sponsors who have made it possible for us to produce this wonderful journal. May I take this opportunity to wish you all our members, our sponsors, partners and friends an Auspicious, Happy and Healthy Year of the Goat! Xin nian kuai le!! I hope you have all had a great summer, feeling refreshed and ready for our autumn programmes!! As we begin a new Friends membership year, I would like to thank Alisan Fine Arts for sponsoring our newsletter for this autumn 2014, spring and summer 2015. Alisan has been a pioneer in bringing art to Hong Kong and has continued to support the art scene since the 1970s. We feel very honoured to have their support and we hope to work closely with Daphne King and learn about their artists and how their gallery works. It is always with sadness each year that we bid farewell to some of our very dedicated volunteers and valued members of the Board, and this year a few key people are stepping down and they are: Diana Williams, Kathie Allderige, Elizabeth Miles and Bonnie Pinkham. Diana has been our Tours Coordinator for as long as I can remember. She has been the heart and soul of Tours. In her 10 years with the Friends, she has organized over 65 tours, which raised a lot of funds but she has also lifted the profile of Friends and recruited many new members via her trips, which are definitely some of our most popular activities. Many of the achievements of the Friends were made possible by the funds raised by Diana’s tours. Diana advised us of her intention to step down earlier in the year to start her own travel business. We are very grateful that she gave us time to restructure and we wish her the very best in her new business venture. She has always been a most supportive and devoted member of the board. We shall miss her dearly. Kathie has been our Treasurer for the past two years. Always super-efficient and wise, she has done a splendid job and it has been a delight to have worked with her. Elizabeth was the main Events Coordinator when I first took over as Chair and we worked very closely together, she is always so calm, positive, sensible - my perfect counselor when I started as Chair - and I have so enjoyed having her on the Board. Bonnie joined us to help with Products early this year but it certainly felt like longer as she is one of the most enthusiastic and fun volunteers I have worked with. In just six months, she helped produce a whole new line for the autumn and find sponsors. Please look out for our new products at the Fairs as they are absolutely beautiful. It has been my privilege to have worked with such special people. On a happier note, I would like to welcome some new members and announce some changes on the workforce, a little ahead of our AGM as I write this, on the Board: Belinda Piggott as our Events and Gallery Group Coordinator, Cynthia Lackey as Products Coordinator, Laure Raibaut and Sagiri Dayal as my co-Vice Chairs, Edwin Mok will help manage ‘Collectors Circle & Donations,’ Alexandra Choa as Young Friends Coordinator; and new volunteers Christine Mar and Clementina Cardoso. I also wish to thank Therese Lesaffre for helping coordinate Tours working with various tour guides/operators as the Friends Tours move into a new phase with different and exciting programmes. Susan Kreidler will be our Treasurer - a familiar member whose long time association with the Friends will be a great asset for the position. Sue Sandberg will take over Newsletter from Gillian Kew and will continue to oversee the website. Gillian, who has been the wizard behind the newsletter, will continue to help with our Friends Fortnightly Flash & Events PR. She will also oversee the Library. Patrick will take over the Study Group and continues to run Daytours. I am very thrilled to be working with such a dynamic group. The Friends are a fun, enthusiastic learning group, and I recently used the slogan in one of our advertising banners- ‘Please come to learn, play and give together!’ - it cannot be more true. In June the Friends co-hosted Visions to the Future with HongKong Land featuring five emerging local artists, four of whom are from CUHK, all under the age of 26. As Chair, it was a very proud moment. It is the efforts of the whole organization that put this together: supporting art education, bringing art to the community and putting the Art Museum on the map. We are particularly grateful to Hongkong Land for their trust in this project. Sandra Walters and the HongKong Land team were instrumental in making it happen. Alexandra Choa, our Young Friends coordinator, worked tirelessly with the five artists to meet all the deadlines and requirements. I would particularly like to thank LuxSurety Company Limited for providing free transportation for the artwork. May and June were particularly busy with Art Basel, Visions to the Future and the CUHK Graduate Art show. The Friends were very proud to see the high calibre of work and creativity at the Annual Graduate and Post Graduate Art Shows at CUHK this year. We thank you all for your continuous participation, contribution and support, whether it is your presence at a talk, tour, lecture, buying our products, participating in Study Group or Daytour, being a volunteer, helping at an activity, sponsoring a project, sharing ideas, giving your time - or for just being a Friend. We are a warm, fun group and together we shall continue to offer a dynamic variety of programmes to our members and community. Look out for many new activities this season: Painter Stuart Leung will demonstrate his painting styles and talk about his 12 paintings of flowers, Hing Chao will talk about Wong Kar Wai and the Kung Fu Masters for our Martial Arts enthusiasts, Eleanor Wong will share with us her family tales in old Shanghai before the family came down to HK and then start their textile business in her beautiful home, Associate Director Josh Yiu of our very own Art Museum will talk about Collecting Chinese Art from 1910s to 2010s, and many more. I look forward to seeing many of you in the coming months and please remember my door is always open, so feel free to contact me, should you have ideas to share, time to give, comments and feedback. I love to hear, to know, to learn and to be able to get to know you all better. I have very exciting news to share with you. In 2006 Friends Chair, Vicki Firth, started the Collectors Circle, inviting members of the group to donate to the fundraising drive on the occasion of the 25th anniversary of the Friends. The purpose of the fund was to allow the Art Museum at CUHK to acquire significant pieces of art that would otherwise be beyond their means. The Art Museum is currently showing, in conjunction with the Ashmolean Museum of Oxford University, two master painters, Lui Shou-kwan and Gao Jianfu. Lui Shou Kwan is often called the father of modern Hong Kong ink painting, and his “Zen” paintings are very well respected and selling at high prices in the auctions. Until now the CUHK Art Museum has had only one of his works, a significant and excellent, large landscape that used to be in the Lee Gardens Hotel but they have no example of his “Zen” style. Apart from this one painting, all the works by Lui in the current exhibition are on loan from the Ashmolean, so it seemed an appropriate time for the Friends to use the earmarked funds to purchase a significant Lui work to compliment the Museum’s current holding. On Saturday March 15th, the Friends proudly presented the painting, “Zen Lotus”, which was selected by the Art Museum. This purchase has been made possible by funds supplied by the Friends, the Friends Collectors Circle, and with the generous cooperation of Alisan Fine Arts and the artist’s daughter, Helen Ting. This gift is a true testimony of our mission and we thank you all; our members, donors, and partners for your support and generosity the past years, to make this happen. I do hope that you are all thrilled and proud. An additional highlight is that on the same day Vicki and Denys Firth also donated and presented, “Luk Keng Village”, another extraordinary piece of work by Lui Shou Kwan to the Art Museum as a parting gift in recognition of all the education and enjoyment provided by the Friends and the staff of the Art Museum over the 18 years they have lived in Hong Kong. It was a double presentation and a double celebration- a true showcase of the support for the Museum from the Friends group and collectors. It was certainly a day to remember! The Friends continues to expand its network in the community- bringing people together through art and culture. This June, Young Friends are particularly proud to present the work of five young artists, four of whom are from CUHK, at the Rotunda, Exchange Square, as part of our initiative to help our young local artists network and reach out. The exhibition is wholly sponsored by Hong Kong Land as part of their 125th Anniversary. Basel. Our Gallery Group has recently regrouped with Elizabeth Miles, Sue Sandberg, and new volunteers, Belinda Piggott, Lydia Dorfman, and Cynthia Lackey, and I know that they have some grand plans in the coming months. Study group continues to be a regular favourite. Tours are as usual, healthily signed up. We thank those of you who have sent in the Tour Surveys which will be very helpful to the future planning of our tours. Bonnie Pinkham, our new Board member in charge of products, will be looking into ideas and designs for new products. We are forever indebted to all our sponsors, partners, donors, and members for their support, donations, and participation. I look forward to seeing many of you at one or two of our events and I would be delighted to hear from you if you have any suggestions, ideas to share, or wish to join the workforce. Cannot believe another year has passed and I am already well into the second year of my term as Chair. It has been a very fulfilling, fun and busy year for the Friends and I am thrilled to share with you what we have in store for you in the coming year. In November, as part of the 50th Anniversary celebrations of the Chinese University, we were very honoured to co-host the Garden Party at home at the Vice-Chancellor’s Lodge, with the University featuring an exclusive Calligraphy Sharing with our special guests followed by a silent auction of some very special works of calligraphy. This year we are particularly excited to work closely as partners with Prof Jenny So, our new Director, and Dr Xiadong Xu and Dr Josh Yiu, our new Associate Directors of the Art Museum, as we step into a new era of the Art Museum. In the coming months, we are happy to continue to offer you our regular activities- Study Group, Tours, The Chair’s Series on old local history, etc but we will also be bringing to you new activities such as the Jewels of India Series, talk on Chinese Costumes and many others. Our volunteers work very hard to put together a diverse programme, hopefully with something for everyone. Please do not miss out on Mr K Y Ng’s talk on the authentication of Chinese Ceramics on 25 Feb at the Kee Club, as Mr Ng will bring genuine and fake samples for a touch and play session. Prof Anna Sohmen’s talk on her father Y K Pao on 20th February and Ms Irene Lee on the history of Hysan in Causeway Bay on 20th March are both very intriguing topics about our local history. Our products have done exceedingly well at the Fairs this year, and I wish to say our special thanks to Ann Mary Stone for her help the last two years overseeing Products and coordinating the Fairs for us. Sadly Ann Mary will step down from Products. She has been a warm, friendly and efficient coordinator and I hope she will remain a Friend and continue to help as a volunteer. We are very lucky that new volunteer Bonnie Pinkham has offered to step in to take over Products. Some of you might have met Bonnie already as she has sat at our products table at one or two fairs in the Oct/Nov and at some of our recent events. We are delighted to have her join the workforce and Bonnie already has many ideas on how to expand Products. We thank you all for your patronage this year, and we are very grateful to our products sponsors, and I hope you have all stocked up on the beautiful Fan Calendar, new Fan folders and the Spirit of the Dragon cards. Please also look out for Collector Edwin Mok’s new book Heavenly Breeze on fans which is available at the Art Museum’s store and through the Friends. Some of you might have attended the talk in early December. Our good friend Edwin is generously donating 50% of the proceeds to benefit the Friends. The book is beautifully put together with amazing pictures- a true feast for the eyes. As we move into a new year, we wish to invite our members to make suggestions and to give us ideas for our way forward. We are sending out a members’ survey on tours and we would be grateful if you could all participate so we get ideas and comments on how we could try to meet everyone’s interests. We are always looking for more volunteers to help us run our activities as we continue to expand our programmes, so please contact one of us should you be interested to help. We are a fun, friendly group to work with. As one of my initiatives as Chair since 2012, Young Friends remain close to my heart and our young and energetic volunteer Alexandra Choa is working on a major exhibition for our Young Friends this May/June, so please look out for our YF news! We are forever indebted to our sponsors, supporters and partners and I would again like to say thanks particularly to: Latham & Watkins, Pacific Harbour Group, KPMG, K Y Fine Art, Galerie Huit, Schmidt Marketing HK, Art Radar Asia, Asia Society, The Epicurean group, The Classified Group, The Kee Club, Sotheby’s, Christie’s, Bonham’s, Hong Kong Land, Dynamic Network Alliances, Hong Kong Trust Company, Yick Fung Printing Company, HK Maritime Museum, Edwin Mok, Angus Forsyth, Sharie Hatchett alias ‘Roxy’ & Virginia Yee. I feel privileged to be working with such a dynamic team- each of us has our own unique and individual responsibilities whilst supporting each other as a group, and I want to say a big thank you to my Board and our volunteers. At the Garden Party, I was delighted to award the Chair’s Pin to our volunteer Ms Marianne Yeo who is a familiar and friendly face to many and has been a compassionate and dedicated volunteer for many years. I also wish to thank all our members and each one of you for your support, as without it, the Friends would not be what we are today. Lastly, may I wish you all an auspicious year of the Horse! Xin Nian Kuai Le! !